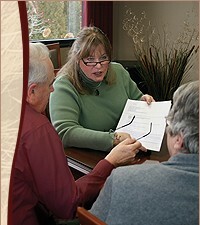 We are very different from most financial planning firms. We spend a great deal of time getting to know our clients - not only what they want, but also who they are. We spend even more time building close ongoing relationships with our clients - giving them the support, insight and financial direction they need for a successful retirement. That is what we want to do for you. When it comes to your lifestyle and your life savings, you need to feel right about the choices you make; and you need to make the choices that are right for you.